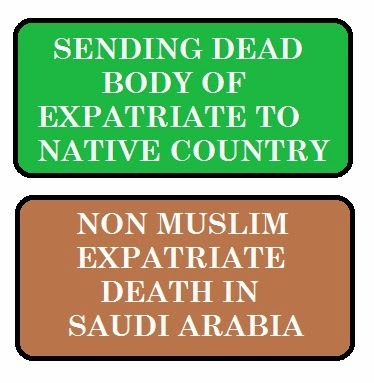 After following the "procedure for expatriate death in KSA", Dead body's home country Embassy will approve (NOC) whether the body has to send home country (Non Muslims & Muslims) or bury in the land of Saudi (Only Muslims). It is important to mention here that solely Muslims may be buried in Saudi Arabia. If some non-Muslim dies in Kingdom of Saudi Arabia, his body must be sent back to his home country. So as to move the dead body, a death certificate from Saudi Arabia Authorities is needed. Moreover, Embassy permission is additionally needed during this regard. it's the responsibility of the sponsor of the dead body to require care of all the executive processes and bear the burden of value attached it. If body has to be repatriated to the home country, sponsor ought to move to Jawazat and surrender the Iqama to urge Final Exit visa. - Required documents has to be present for sending the body to home country. Deceased person's (Passport, Entry Visa, Iqama, Death certificate in English, Written Address of family in Arabic, Approval from Embassy, Medical report in English, Copy of Power of Attorney from heir in Arabic signed and by Notary Public, Police report copy (If un natural death), Letter from sponsor regarding dues). - To repatriate the dead body, legal heirs should present an affidavit to the office of home country that they will collect the body without any delays. - All Arabic documents should be attended with Associate in Nursing English translation certified by the Embassy. Airlines need 5 certified copies of all documents with reference to the death, and a letter from the rhetorical Medical Office/Morgue. As a result of getting the required papers and translations could be a advanced and official endeavor, the Embassy will give in depth procedural steering.